It was the best event we have been to all year. Excellent, clear information delivered with good nature. I learned SO much, have been educating all my friends! I got in touch with my desires so I can give specifics to my kids. Wonderfully presented! 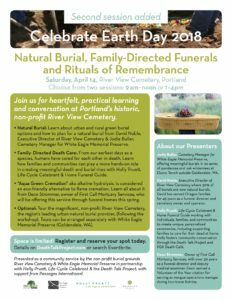 In the back of my mind I have wanted a natural burial, but knowing more of the details and the possibilities, I am ready to go forward with my plan. There was not, as my husband feared, an attempt to sell services. The presenters were all engaged and passionate, bringing us tons of information in a comfortable setting. I loved the feel of the cemetery surrounding us and the accessibility of the presenters in such a small group! Supportive and helpful all around! The best parts were having so many knowledgeable, articulate and experienced experts presenting in one seminar – and hearing their passion about returning death care to families and communities & the simultaneous heartache over how far removed American society has become from death and dying.